(b) Make substantial efforts for an early and successful conclusion of the Doha Round with an ambitious, comprehensive, balanced and development-oriented outcome. Actions by LDCs and their development partners include resisting protectionist tendencies and rectifying trade-distorting measures, addressing non-tariff measures, implementation of DFQF market access, enhanced support for Aid for Trade and the EIF. Double LDCs' share of exports by 2020. Conclude Doha Round (not new target). 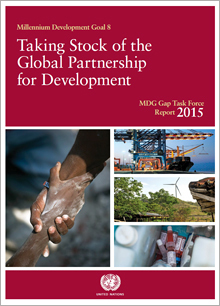 LDCs' share in world exports was just 1.1% in 2013. See other related commitments listed above. LDCs's share in world exports is too low. Most commitments are not new; see related commitments listed above.